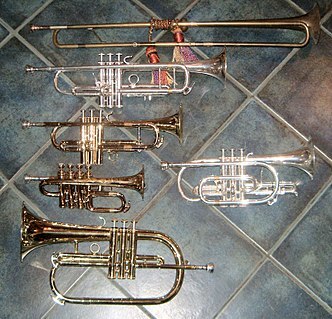 Six high brass instruments Left, from top: A reproduction baroque trumpet in D, a modern trumpet in B♭, a modern trumpet in D, a piccolo trumpet in B♭ (octave higher), and a flugelhorn in B♭. Right: a cornet in B♭. A tenor horn (alto horn) in E♭, baritone horn in B♭, and euphonium in B♭. Valved brass instruments use a set of valves (typically three or four but as many as seven or more in some cases) operated by the player's fingers that introduce additional tubing, or crooks, into the instrument, changing its overall length. This family includes all of the modern brass instruments except the trombone: the trumpet, horn (also called French horn), euphonium, and tuba, as well as the cornet, flugelhorn, tenor horn (alto horn), baritone horn, sousaphone, and the mellophone. As valved instruments are predominant among the brasses today, a more thorough discussion of their workings can be found below. The valves are usually piston valves, but can be rotary valves; the latter are the norm for the horn (except in France) and are also common on the tuba. Cylindrical bore brass instruments are those in which approximately constant diameter tubing predominates. Cylindrical bore brass instruments are generally perceived as having a brighter, more penetrating tone quality compared to conical bore brass instruments. The trumpet, and all trombones are cylindrical bore. In particular, the slide design of the trombone necessitates this. Conical bore brass instruments are those in which tubing of constantly increasing diameter predominates. Conical bore instruments are generally perceived as having a more mellow tone quality than the cylindrical bore brass instruments. The "British brass band" group of instruments fall into this category. This includes the flugelhorn, cornet, tenor horn (alto horn), baritone horn, horn, euphonium and tuba. Some conical bore brass instruments are more conical than others. For example, the flugelhorn differs from the cornet by having a higher percentage of its tubing length conical than does the cornet, in addition to possessing a wider bore than the cornet. In the 1910s and 1920s, the E.A. Couturier company built brass band instruments utilizing a patent for a continuous conical bore without cylindrical portions even for the valves or tuning slide. In most trumpets and cornets, the compensation must be provided by extending the third valve slide with the third or fourth finger, and the first valve slide with the left hand thumb (see Trigger or throw below). This is used to lower the pitch of the 1–3 and 1–2–3 valve combinations. On the trumpet and cornet, these valve combinations correspond to low D, low C♯, low G, and low F♯, so chromatically, to stay in tune, one must use this method. In instruments with a fourth valve, such as tubas, euphoniums, piccolo trumpets, etc. 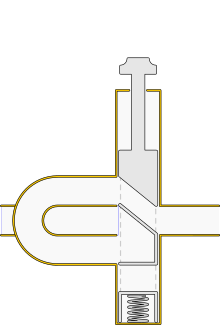 that valve lowers the pitch by a perfect fourth; this is used to compensate for the sharpness of the valve combinations 1–3 and 1–2–3 (4 replaces 1–3, 2–4 replaces 1–2–3). All three normal valves may be used in addition to the fourth to increase the instrument's range downwards by a perfect fourth, although with increasingly severe intonation problems. The compensating system was applied to horns to serve a different purpose. It was used to allow a double horn in F and B♭ to ease playing difficulties in the high register. In contrast to the system in use in tubas and euphoniums, the default 'side' of the horn is the longer F horn, with secondary lengths of tubing coming into play when the first, second or third valves are pressed; pressing the thumb valve takes these secondary valve slides and the extra length of main tubing out of play to produce a shorter B♭ horn. A later "full double" design has completely separate valve section tubing for the two sides, and is considered superior, although rather heavier in weight. Traditionally the instruments are normally made of brass, polished and then lacquered to prevent corrosion. Some higher quality and higher cost instruments use gold or silver plating to prevent corrosion. A few specialty instruments are made from wood. Instruments made mostly from plastic emerged in the 2010s as a cheaper and more robust alternative to brass. Plastic instruments could come in almost any colour. The sound plastic instruments produce is different from the one of brass, lacquer, gold or silver. While originally seen as a gimmick, these plastic models have found increasing popularity of the last decade and are now viewed as practice tools that make for more convenient travel as well as a cheaper option for beginning players. ^ Baines, Anthony (1993). Brass instruments: their history and development. Dover Publications. p. 300. ISBN 0-486-27574-4. Schlesinger, Kathleen (1911). "Bombardon" . In Chisholm, Hugh (ed.). Encyclopædia Britannica. 4 (11th ed.). Cambridge University Press. p. 182. ^ Orchestration, Forsyth, Cecil; MacMillan Books, 1922. ^ "Brass instrument (lip reed) acoustics: an introduction". newt.phys.unsw.edu.au. ^ "Brass instrument (lip reed) acoustics: an introduction". www.phys.unsw.edu.au. Retrieved 2017-12-10. ^ "Yamaha Catalog "Professional Trombones"". yamaha.com. Archived from the original on 2009-09-01. Retrieved 2009-10-25. ^ The Besson Prestige euphonium.